The prompt for this project was to design one unit that, when repeated, can become many different things. Alone, it must serve a purpose as well as when grouped together. The three qualities we chose for this group project was a seat, which allows the unit to stand alone, a screen, and a sculpture, to create spatial qualities when the units are grouped together. PROJECT TYPE: Team / We worked together as a studio of 15 students to design and fabricate this project. We broke into teams to divide up tasks but we were all heavily involved in production. MY ROLE: I worked on the initial precedent research, concept and fabrication of the units. To begin the project we started individually, focusing on studying patterns. For my personal exploration, I started with breaking down patterns into singular parts to understand how one piece, when repeated, can create a field. To develop my own unit, I took cues from the houndstooth pattern and worked through designing one shape that, when repeated, would create an angular pattern. This resulted in these final chipboard models. As a team, we merged our personal explorations and understanding of patterns to develop our spatial unit. We wanted the unit to be sculptural yet have a function, so we chose to make the unit seating. We wanted the unit to have a clean elevation in 2D but depth in 3D so we focused on angles. 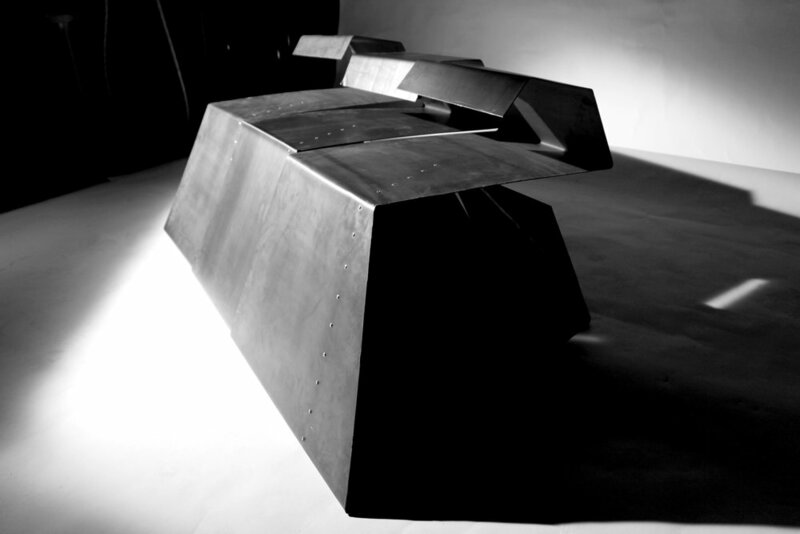 The trapezoidal shape grew out of our precedent studies on folding metal. The project also required that the unit be repeated twelve times and all together become a sculptural object and a screen. Therefore, we knew we had to have depth to the unit to make it strong enough to stack and support bodyweight. We decided steel would be the best material to use for the final because it is strong and would allow us to achieve those thin, clean lines in elevation. We began our iterative process with sketches and chipboard model making to test how the design would translate from 2D to 3D. Then we did material studies to test how we can manipulate steel to make what we had designed. This is the video I made with Adobe Premier to document our process. Using the template we developed, we cut out the shape of our units from the steel sheets and drilled holes for the rivets. We sanded down the sharp edges and used a jig to fold the sheets into our trapezoidal design. Lastly we riveted the structural piece into the base. This project took a lot of coordination considering how many students were involved. However we were able to group ourselves around specific task which helped us achieve a good result. I found myself stepping into a leadership position when it came to delegating tasks at the beginning of the project and it was an important test for me. I learned how to listen to my partners, collaborate on concept and break tasks down into manageable bites between team members.